The timeline shows Alphabet's quarterly revenues as of the fourth quarter of 2018. The most recently reported period, Alphabet's revenue amounted to 39.3 billion U.S. dollars, up from 33.7 billion U.S. dollars in the preceding quarter. 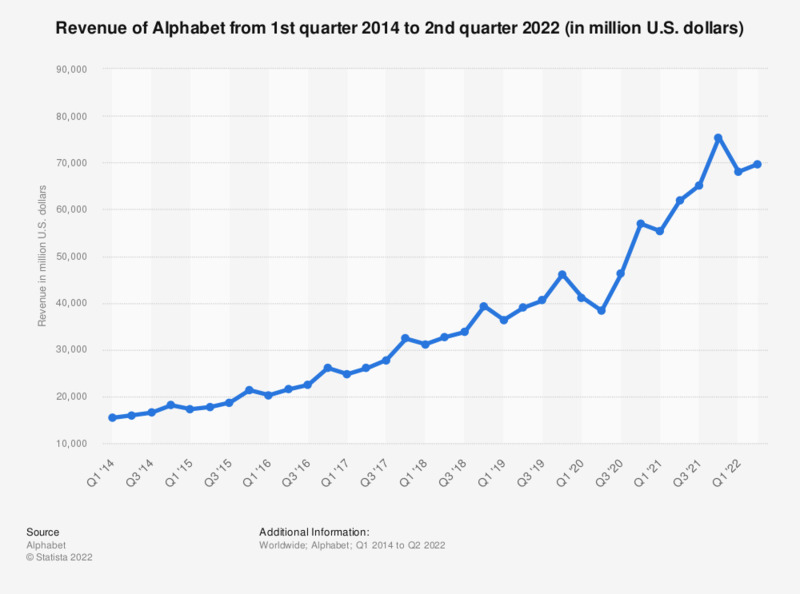 Alphabet's main revenue source is advertising through Google sites and online products. The company's Other Bets segment also includes businesses such as Access/Google Fiber, Calico, Nest, Verily, GV, Google Capital, X, and other ventures. *The table below provides summary data to facilitate comparison of current quarter performance to prior periods given the announcement on July 18, 2018 by the European Commission (EC) of its decision that certain contractual provisions in agreements between Google and Android partners infringed European competition law and the associated €4.34 billion ($5.07 billion as of June 30, 2018) fine. The table includes the effect of the EC fines accrued in Q2 2017 and Q2 2018. Statistics on "Digital search advertising in the United Kingdom"